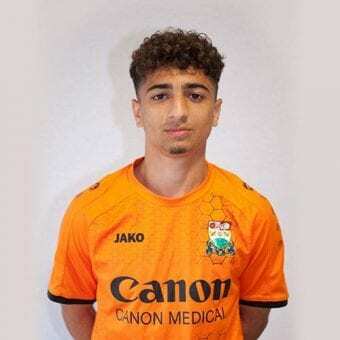 17 year old UK Cypriot Antonis Vasiliou made his debut for Barnet FC on Monday in their home draw versus Bromley. Antonis has been at Barnet for a few years and came on as a substitute for Fonguck. Shaq Coulthirst clinched the equaliser with 20 minutes to go to cancel out Jordan Higgs’ opener in the early stages of the second half. The Bees made three changes from the side that lost 1-0 away at Fylde on Friday. Dan Sweeney’s suspension meant Ricardo Santos returned to the starting line-up alongside Dan Sparkes and Wes Fonguck who replaced Medy Elito and Harry Taylor. As for the visitors, they lost 2-0 at home to Solihull last time out and made the one switch with top scorer JJ Hooper coming in for Brendan Wiredu. Neither side posed a real attacking threat in the opening stages of the game but the Bees did put the ball in the net on 13 minutes. Wes Fonguck set up Ephron Mason-Clark who slotted home from close range but the referee blew for a foul in the build-up to the goal. It proved to be a very quiet first half-hour, but the visitors should have put their noses in front soon after when Higgs fizzed his shot wide from just inside the area. Up the other end and the Bees had a golden chance themselves. After Elliott Johnson did well to find Mason-Clark at the back-post, the latter hit the ball first time but was denied by a fine save from David Gregory. With five minutes of the first period remaining, Hooper latched onto a cross but his dipping header could only land on the outside roof of the net. The second half started much livelier than the first with Bromley opening the scoring three minutes after the break. Former Bee Richard Brindley pinged a ball in from the right which landed perfectly for Higgs to head home. The hosts could have equalised on the hour mark when Jack Taylor was played through before the youngster pulled the trigger but his shot deflected out for a corner. Simeon Akinola, who replaced Sparkes earlier in the second half, nearly fashioned one of the goals of the season shortly after. The ball floated out to the wide-man who produced a spectacular overhead kick which bounced in front of Gregory who had to tip it over. Barnet’s attacking threat soon paid off as they bagged an equaliser with 20 minutes left on the clock thanks to Coulthirst who found space to fire into the back of the net from close range. The Ravens really should have gone back in front 10 minutes later though when George Porter was played through on goal. One on one with the goalkeeper, the attacker slotted the ball past Cousins but his effort could only roll against the post. Hooper then saw his effort from close range drag wide of the post in stoppage time as Darren Currie’s side managed to hold on to clinch a draw. The Bees return to action next Saturday as they face a trip to Havant & Waterlooville as we aim to end the season on a high. BARNET: Cousins, Alexander, Johnson (Box), Reynolds (c), Santos, Coulthirst, Sparkes (Akinola), J.Taylor, Boucaud, Fonguck (Vasiliou), Mason-Clark. BARNET UNUSED SUBS: Matrevics, Robson. BROMLEY: Gregory, Sutherland, Johnson (Okoye), Holland (c), Raymond, Higgs, Porter, Wood, Brindley, Coulson, Hooper. BROMLEY UNUSED SUBS: Nakov, Dunne, Enver, Ogunmekan. In the Cyprus Championship play offs AEK are back in with a chance of the title after beating Apoel 1-0 , and Apollon dropping points by drawing 1-1 with their Limassol rivals AEL. UK Cypriot Michael Georgiou avoided a slice of unwanted snooker history at the Crucible but could not stop Neil Robertson skating through to the second round of the World Championship. Thessaloniki-based PAOK also became the first non-Athens team to win the league title since Larissa did it back in 1988. Crystal Palace put a dent in Arsenal’s Champions League qualification hopes after strikers Christian Benteke and Wilfried Zaha made the most of defensive errors in a 3-2 win at the Emirates Stadium on Sunday. Paris St Germain may have clinched their long-expected sixth Ligue 1 title in the last seven seasons but that triumph cannot mask the French club’s shortcomings on the European stage where results have failed to match their huge investment.